Some 4,000 people a year are dying from the effects of asbestos, the Health and Safety Executive has said. The HSE says a quarter of the victims are former tradesmen, but it fears today's plumbers, electricians and joiners underestimate the ongoing risk. Asbestos was used for fire-proofing and insulation until a ban in 2000, but it remains in some 500,000 UK buildings. But the Ucatt union said the HSE is failing to fully investigate workers' complaints about exposure to asbestos. It can cause cancers and lung illness if its dust is inhaled. Exposure to the material remains the biggest single cause of work-related deaths, likely to peak at around 5,000 per year in the next five years, the HSE says. On Monday, Selfridges replaced the display windows of its 100-year-old Oxford Street store in London after the substance was found in some of the frames. 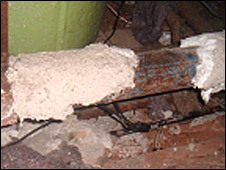 If asbestos fibres are disturbed by drilling or cutting during refurbishment, they can prove deadly. Illnesses, most notably the lung cancer mesothelioma, typically take between 20 and 50 years to develop, depending on the levels and frequency of exposure. The majority of those affected today are former employees in industries such as shipbuilding and the railways. The HSE says research suggests exposure kills on average six electricians, three plumbers and six joiners every week and it fears those numbers could grow in the future because of complacency. It believes only one in 10 current tradesmen recognises the danger and is launching a campaign to raise awareness. Former carpenter Tom King, 65, from south east London, was diagnosed with mesothelioma - cancer of the lining of the lung - two years ago. He had cut and fitted asbestos boards as a trainee, before its dangers were known, and the illness forced him to retire. But Mr King said young tradesmen were failing to heed the warnings. "My son took over my business and the labourers who work for him are half-hearted about wearing a mask, even though they know what happened to me," he said. "Some of them don't seem to have been taught that it's still in a lot of old buildings." HSE disease reduction programme director Steve Coldrick said: "We have a legacy of 500,000 commercial or industrial buildings in this country which still contain asbestos and the it is tradesmen who are at risk from it now. "Unless we make them really understand the problems it can cause, in 20 or 50 years time we will have even more people dying." But Alan Ritchie, general secretary of builders' union Ucatt, said members who raised concerns about working with asbestos were rapidly losing confidence in the HSE. "When investigating these complaints, rather than talk to the workers whose health is being put at risk, they instead simply speak to the management, who invariably give the organisation a clean bill of health." Meanwhile Prof Rory O'Neill, of Stirling University's Occupational and Environmental Health Research Group, said the HSE's figures were a "woeful" underestimate of the death rate. "A more realistic figure would be 5-6,000," he said, adding that the HSE lacked resources to carry out necessary checks. Jill Morrell, from the British Lung Foundation said: "The asbestos-related cancer mesothelioma is a cruel disease which as yet has no cure. "We must do all we can to prevent more people dying from this preventable disease"
Despite the warnings, the HSE stresses that asbestos which is sealed and in good condition rarely poses a risk unless it is disturbed.